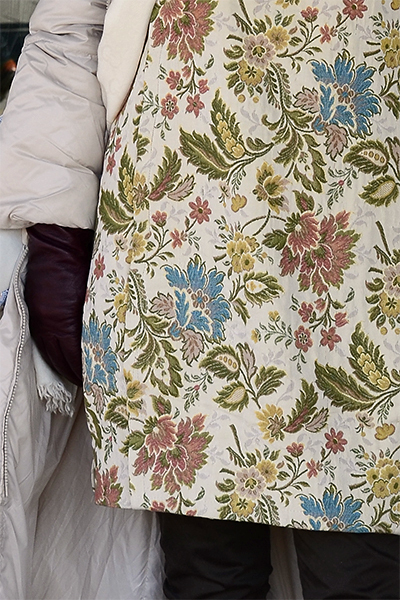 I have been keeping this rather huge shapeless short pinafore-type of handmade but store-bought dress which was probably made of an old aureate kind of curtain for some time. 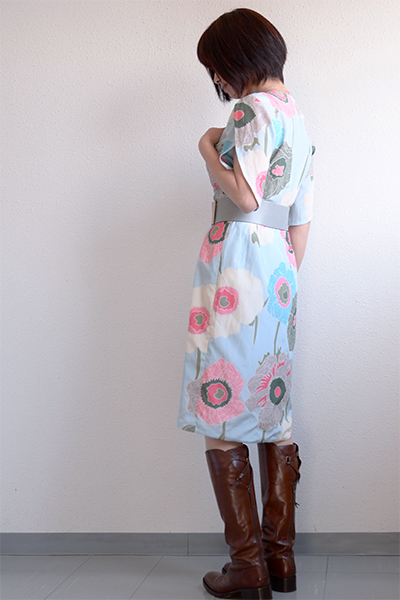 Though the fabric is very vintage-y and also the dress does look very handmade as well as refashioned in a slightly bad way, I've been loving it all the time. It does look, well, interesting to my eyes. So I sewed a pair of fitted pants for the purpose of wearing this dress a bit differently. The pattern I used for them was Anita Ponti Pant from Tessuti Fabrics. While Anita pattern calls for ponti knits and alike for making the results wearable, I used a well stretching woven fabric experimentally. For them, I cut in size12 instead of using my regular size (size8) because I didn't know how much extra I needed with this fabric (or even didn't know how successful this project to be either). I tried them for fitting and then realized I could have cut in my regular size after all. Typical. I don't think all stretch woven fabrics can do the same, but my fabric worked very nicely in the end. In case you wonder how they look without the dress layer, I took some pictures of them without my dress (I think I'm going to use them only for the dress, though). What do you say about "dresses over pants" look? I start to think it's OK and very practicable. It doesn't harm anyone, at least. Have a very happy week, everyone! shortened by 2cm, hem widened slightly, front crotch lowered by 6cm while back crotch left intact. fabric: cotton stretch twill, pant weight, mid-body, brown, stretches well. "Emerald" is the pattern name for Thai style wide pants from Tamanegi-kobo. I really love this pattern!! I have posted my two pairs here and here in this blog, but I have to say they're just two of many that I sewed in the past. Anyway, I have made an wintry version in a heavy wool fabric and they turned out nice, actually nicer than I had wished. 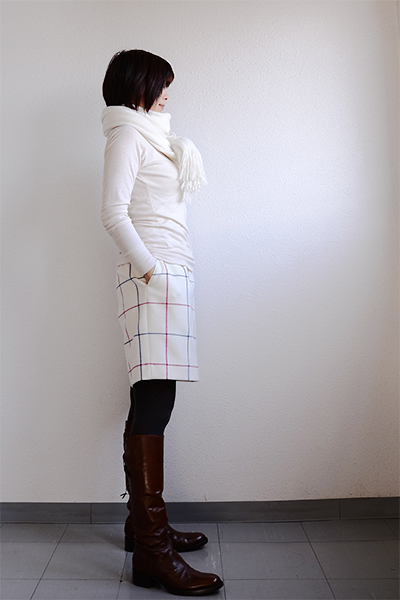 I rarely wear shorts in winter, but I'd change my mind as they look pretty in wintry outfit. I also have to mention that they are warm, much warmer than those mini skirts in the same length, in my opinion. I think they're great! - shortened the pants by simply cutting off the length and made them above knee. - chose one larger size as the fabric was very stiff and thick(coat weight). The pants are not lined. - used a stiff cotton twill for facing and a plain thin cotton for pocket housing, to avoid an extra bulk. Fabric: wool/nylon (95/5), felted thick twill fabric, off white, plaids in navy blue and cranberry red. has a smooth surface and causes no problem on bare skin. slightly raised and warm. They look like a skirt in the front view, and I like how they are. 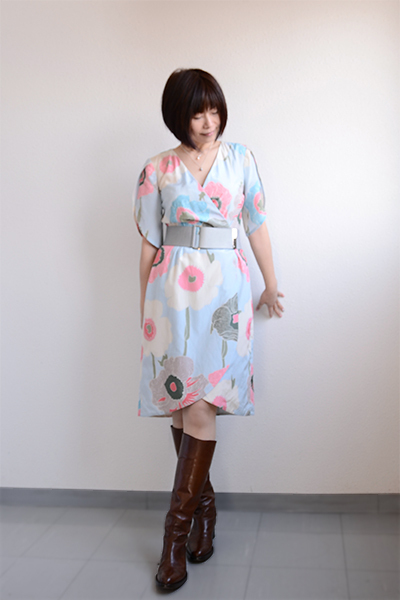 As it is cold and wintry here in Japan, I wore it with my boots and wider belt today. My camera is grumpy at this moment but I hope you're having a great week! - I have chosen my size according to my bust measurement and had my usual narrower shoulder adjustment (pinched by 1cm at each shoulder point). Sizes seemed very true to the measurements. - I have made the V neck opening slightly wider at the shoulder and about 1cm shallower at center front. - I added extra 5cm in width to the front left skirt(the one under the other front skirt) for a larger overlap of front skirts. - I made the wrap front into a mock-wrap by closing the front dress. I sewed the front bodices and skirts to close them at the waistline, and applied a long invisible zipper at the left side of the dress. fabric: cotton/silk(80/20), lawn, thin, flowery prints on light blue color. Soft and light. Sorry for these blur photos, my camera must have been having her "bad hair day"(poor thing).